In my previous blog post, I spoke to how the design of Lumosity’s game and interface was heavily influenced by the “projected identity” of the player. This is not to evaluate the effectiveness of these brain games, but highlights the dynamic a desire to become intelligent and trust in technology to satisfy this goal. 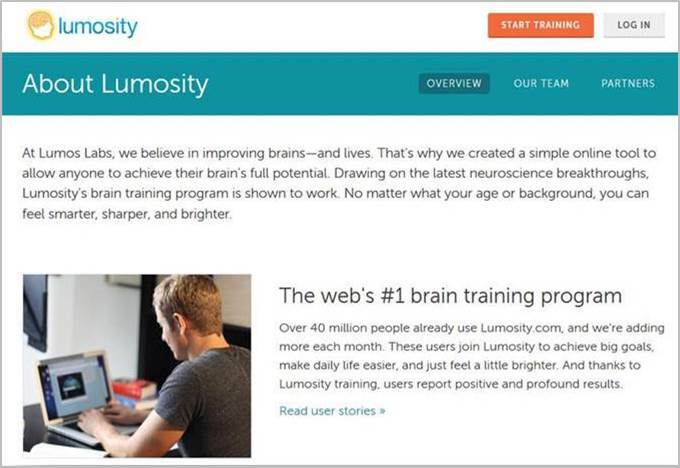 Lumosity’s marketing targeted consumers who felt a need to become smarter. The “real world” identity of its consumers included people with serious medical conditions, older adults who were experiencing age-related cognitive decline, and students. The “virtual identity” was a concrete profile that Lumosity provided with age comparisons, self-evaluations, and etc. The “projected identity” of these targeted consumers drove Lumosity’s marketing, but was never backed up by scientific research. According to Jessica Rich, Director of the FTC’s Bureau of Consumer Protection, “Lumosity preyed on consumers’ fears about age-related cognitive decline, suggesting their games could stave off memory loss, dementia, and even Alzheimer’s disease.” Lumosity not only used the “projected identity” as their key marketing aspect, but highlighted how the games were co-designed by game designers and scientists. This raises some key issues about the human behavior: what makes science and research so ‘promising’ without question? What makes a piece of technology a qualified evaluation tool? Maybe their clients got tired of “traditional” ways of training their cognitive abilities, and found the appealing brain games more trustworthy. When I reflect on my experience with the game, I have to ask: Do I believe that they made me smarter? I had fun, which is why it’s a casual game according to Juul’s definitions. As an educator, I did not find the games effective because the content is not situated, and therefore not translatable. The game designers focused so much on the procedural style of learning skills that they failed to create content that was contextualized in real-world experiences and isolated these skills to their steps and not their application. My “projected identity” is being developed in other ways, and without the need to rely on brain games that tell me I’m smart. “Brain training” with Lumosity — does it really work?